Sphynx cats are lively, comical, and intelligent creatures. Devoted, outgoing, and always in the mood to snuggle. Part monkey, child, and dog - the best way to describe a Sphynx. Thank you for visiting our website! Please take your time in looking through our various pages. We've been raising Sphynx cats since 2002 and have learned a great deal about these amazing creatures in the process. With time we've also developed an eternal passion for this wonderful breed. Please feel free to write or call with any questions you might have. See more of our past and present kitties here. 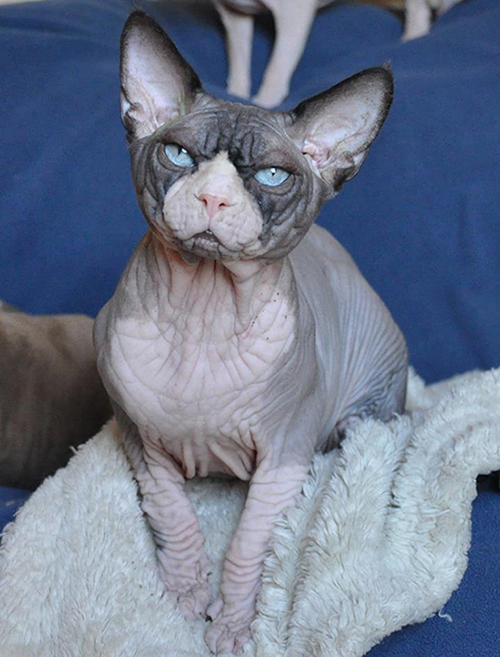 Two Sphynx Litters Coming in May! Moorea and Caprica are great mothers; we can't wait to see their little ones. Lincoln had a completely normal echo today at the pivotal age of 8! Most HCM positive cats reveal their disease by 8. 1. A carb-free diet is most appropriate for felines.